Social network analysis maps relationships and transactions between people and groups. This text was the first book-length application of this method to the ancient world, using the abundant documentary evidence from sixth-century Oxyrhynchos and Aphrodito in Egypt. 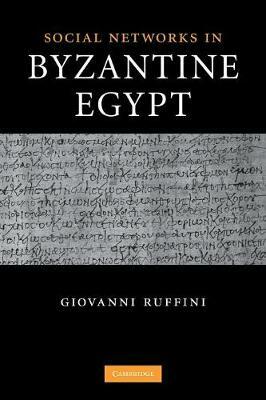 Professor Ruffini combines a prosopographical survey of both sites with computer analyses of the topographical and social networks in their papyri. He thereby uncovers hierarchical social structures in Oxyrhynchos not present in Aphrodito, and is able for the first time to trace the formation of the famous Apion estate. He can also use quantitative techniques to locate the central players in the Aphrodito social landscape, allowing us to see past the family of Dioskoros to discover the importance of otherwise unknown figures. He argues that the apparent social differences between Oxyrhynchos and Aphrodito in fact represent different levels of geographic scale, both present within the same social model.